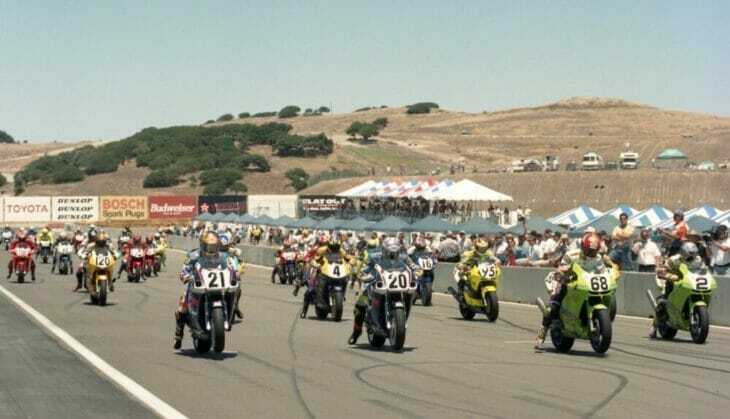 In this week’s Throwback we dial back the time machine 22 years to the 1997 racing season and the July combined World Superbike/AMA Weekend at Laguna Seca. One of the support races that weekend was AMA/Pro Honda Oils 600 Supersport. This photo shows the start of that race, just as the riders were launching their machines off the line. The race ended up being a thriller between Yoshimura Suzuki riders Aaron Yates (No. 20) and Pascal Picotte (No. 21). The two battled all the way through the final lap swapping the lead several times. On the final lap Yates passed Picotte entering the corkscrew and held on to win by just .150 of a second at the checkered flag. It marked Yates’ first victory in the series that season. In this photo you see Picotte (No. 21) starting from the pole, which in this case was the outside of the track by rider choice. Yates (No. 20) is next to him. Mike Smith aboard the No. 68 Kinko’s Kawasaki and his teammate Jamie Hacking (No. 2) round out the front-row starters. Also visible in the shot are Eric Bostrom (No. 120), Steve Crevier (No. 4), Matt Wait (No. 95), Tom Kipp (No. 16) and others.